When the light and weather is right, parts of Erith can at times look positively exotic. 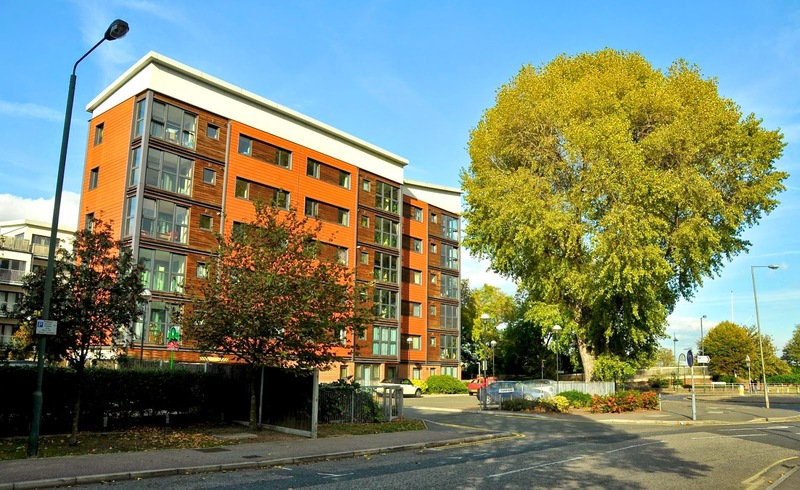 The photo above shows the key worker apartments (called Tramway House) on the corner of Stonewood Road and West Street, right next to the new Bexley College site. The apartments overlook the Riverside Gardens and the River Thames in one of the nicest locations in the town. If the flats had been built in somewhere like Putney, they would be the thick end of a million pounds or so. Only a matter of weeks after Erith KFC gave up in their bid to open their drive through around the clock, another local restaurant is bidding for a late – night licence. K’s Spice – the Nigerian restaurant in Pier Road, has submitted an application to Bexley Council to extend its opening hours; currently the place opens from 10am until 11pm, and the owners wish to extend this until 2am daily. I don’t think that the application will meet with success, as there are flats located above the shop unit, and opening into the early hours of the morning would undoubtedly cause noise and disturbance. It would be interesting to see if the council licensing team take other criteria into account when deciding whether to grant opening hour changes to food outlets. For example, should they take account of the restaurant’s “Scores on the Doors” food hygiene rating? If this is the case, then K’s Spice would be on a sticky wicket, as it only gets a rating of one out of a possible five stars for kitchen cleanliness. As I have written in the past (and many reader have agreed with) in my opinion, any restaurant that fails to meet a minimum of three out of five stars (which is described as being the lowest acceptable rating) should be compulsorily closed until such time as the place is deep cleaned, and new equipment installed so that their rating meets or exceeds a three star rating. The “Scores on the Doors” rating sticker should also have to be displayed by law. I notice that whilst food outlets in Bexley hardly ever have their rating stickers displayed, food outlets in Dartford are far more likely to publicly show their stickers. I think this could at least part be because Dartford’s restaurants seem to overall have a higher standard of food hygiene. I was walking around Dartford Town Centre last weekend, and I noticed with satisfaction that almost all places had a four or five star rating, which they proudly displayed on their window sticker. I don't know the reason for the discrepancy between Dartford and Bexley, other than as we know, the London Borough of Bexley has the worst food hygiene ratings in the whole of the UK. Whether Bexley have less staff available to police the system, or Dartford better promote and foster good food handling and preparation techniques I don't know, but the message seems to be clear. If you are going out for a meal in the local area, you are probably better off going to Dartford if you want to avoid the possibility of food poisoning. Dartford has another point in its favour if you read comic books. News Stand Comics have opened a comic book store in the shop unit at the base of the clock tower opposite Dartford Station and behind the Orchard Theatre. It used to house the tourist information centre, but now is the home of a wide variety of comics, action figures and collectibles. Until now local comic fans had to go to Bluewater or London to buy the latest editions. Now there is somewhere more local to go. I wish them well. Hearing of the sad death of actor Bob Hoskins this week, it did remind me of an incident that happened many years ago, not long after I had passed my driving test. I was accompanying a friend who was still a learner so that he could get some much needed practice (back in those days you could legally accompany a learner as soon as you had passed your test, unlike today). It was a Sunday afternoon, and we were driving along Romney Road in Greenwich, right outside the National Maritime Museum, and had stopped at a Zebra crossing. There was a bang and a sudden jolt; momentarily I thought my friend had dumped the clutch and stalled the car. We then both realised that the car had been rear – ended by another vehicle. I looked over my shoulder and saw a large, dark green Jaguar XJ-6 saloon far too close for comfort. I told my friend to pull over to the side of the road, and the Jaguar followed. The night before this incident, ITV had shown the television premiere of “The Long Good Friday” – a movie which is now regarded by many critics as the finest British gangster film ever made. I had watched it, and was much taken by the performance of Bob Hoskins, as the tough and resourceful London gang leader who tries to move into property development, and unwittingly ends up on the wrong side of the IRA. Anyway as we checked the very minor damage the bumper – little more than a small dent if I recall, who should get out of the Jaguar than Bob Hoskins himself! As he came over to us, a woman at a nearby bus stop came over and started jabbering “I saw it all – he rear ended you – it’s all his fault!” Hoskins turned to her and said “it OK lady, I have it under control”. He turned to us and said “completely sorry – all of my fault”, and the interloper cut in a second time with more nagging. Hoskins now growled at her “I have told you – SHUT IT!” Which did the trick – the woman was so taken aback she was silenced. He pulled out his wallet, saying “can we sort this out like adults? Would £200 do to fix your bumper?” Bearing in mind the entire car was probably worth a maximum of £200 back then, my friend accepted gladly – he knew he was getting an amazingly good deal. Bob Hoskins was friendly and open, though we only spent a few minutes with him, he seemed like a genuine, completely down to earth bloke. The advert above was first published back in 1903. 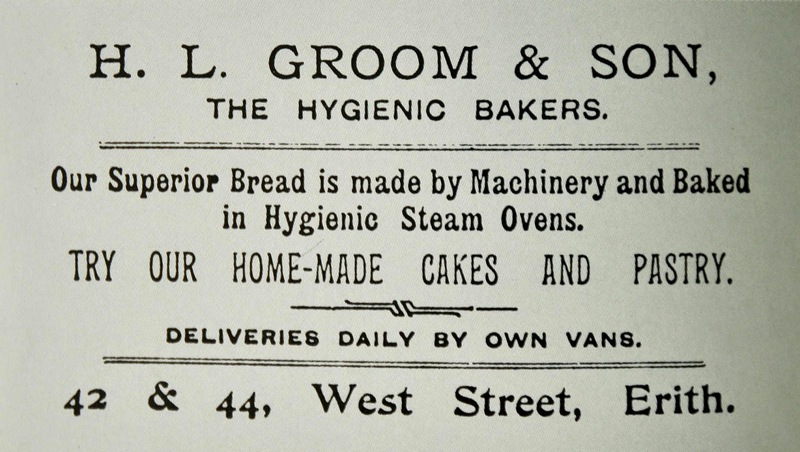 It does rather infer that other local bakers were not hygienic - I am not sure if such an advert would be permitted nowadays. Still, it does show that even 111 years ago, a local food producer was very conscious about cleanliness. Something that some local outlets today seem to have forgotten. Have you ever dug an old computer, games console, or other bit of long forgotten old electronic kit out of a cupboard or loft, only to find that the original, light grey plastic case had turned a nasty tobacco brown colour? Many people think that this is just a bit of ingrained dirt – but the staining does not come off, however much you scrub. This unwanted phenomenon has been known for several years, and has been researched by a number of people keen on restoring vintage home computers. The problem is caused by the special kind of plastic used to manufacture the cases. It is called ABS (acrylonitrile butadiene styrene – you can see why even the scientists just call it ABS!) The plastic is made of three different substances, which when mixed together in certain proportions give the plastic its strength, flexibility and impact resistance. The trouble with ABS plastic is that it is very flammable unless steps are taken to do something about it. Scientists came up with a flame retardant chemical that could be added to the ABS plastic mix to stop it combusting. The chemical was one of the CFC group – which you may recall used to be widely used, until it was discovered that they caused serious damage to the Ozone layer, and were then internationally banned in the 1990’s. Back in the 1980’s though, the chemicals were used in all sorts of ways. The discolouration of ABS plastic cases is caused by a chemical reaction when strong sunlight containing a high percentage of Ultra Violet (UV) light is allowed to shine onto the plastic. Any computer left on a desk in an office, or games console left in a kid’s bedroom would suffer this. The UV light causes the element bromine from within the CFC fire retardant to slowly leak out of the mix – bromine, which is naturally a brown colour – and this is what causes the tobacco – like staining to the ABS plastic. A group of hobbyists, some of whom have a background in chemical engineering have worked on a way to remove this horrible discolouration which can seriously affect the looks of what otherwise would be some attractive and historically important computers. They have created a cleaning gel called RetroBrite, which when pasted onto the discoloured ABS plastic surface of an old piece of electronic kit, then exposed to a UV lamp for a few hours, will completely remove the brown discolouration and return the object to an “as new” appearance. For various technical and legal reasons, this bunch of enthusiasts have been unable to patent RetroBrite, and instead publish online their formula for making it, and instructions on how to use it. To be honest, RetroBrite is pretty nasty, corrosive stuff, and has to be treated with caution. You can read more about it here. If you ever see RetroBrite available for retail sale, it has been produced by a third party, not the original creators. Because one of the active ingredients in RetroBrite is high strength Hydrogen Peroxide, it is illegal to transport by post or courier. Some shady characters have offered pre – mixed RetroBrite bottles for sale on EBay. This actually contravenes the website’s rules, as it is regarded as a hazardous chemical. If you ever see RetroBrite for sale, it is dodgy. Making it from the recipe on the RetroBrite website is perfectly acceptable, however, and to be honest, it works best when it is freshly made. You can read a detailed account as to how it is made, and how it actually works by clicking here. I seem to be having a bit of a Dartford oriented theme this week; readers may recall that a couple of years ago that I observed that whilst Liverpool never ceases to find excuses to celebrate the Beatles, and their links with the city, Dartford seems almost embarrassed to be the home of the Rolling Stones in comparison. OK, you have the Mick Jagger Centre, but that is about as far as it goes. Some years ago a campaign was started to get a blue plaque erected on Platform 2 of Dartford Station, to commemorate the place where Keith Richards and Mick Jagger first met on returning from buying obscure blues albums in Soho. They discovered they shared a deep love for the music, and the rest, as they say is history. The plaque campaign came to nothing, and currently there is no form of commemoration at all. One thing has changed though. A local company has started running something called the Satisfaction Tour, which describes itself as “Join us on a fascinating and fun – filled coach tour of Dartford – Mick Jagger and Keith Richards’ home town. Discover where Mick and Keith grew up and met before the formation of the Rolling Stones, the world’s greatest rock and roll band. Tour guests staying at the Hilton Dartford Bridge Hotel will be collected from the hotel and taken to Dartford Railway Station, where the tour begins. The tour will then take you onto the places associated with Jagger and Richards early years, such as visits to their childhood homes and schools. Dartford Railway Station where Keith and Mick became reacquainted on platform 2 in October 1961; The hospital where they were born; Keith's teenage home; Holy Trinity Church where Mick was christened and Keith sang in the choir; Len Goodman's Dance Studios; Keith's childhood home where we visit the garden and his bedroom. Near here you will have the opportunity to stop for refreshments. Mick's childhood home; Wentworth Primary School where Keith and Mick first met; Dartford Technical College where Keith attended (now Wilmington Grammar); Mick's teenage home; Dartford Grammar School where Mick attended.” I would imagine that this would generate a lot of interest amongst foreign Stones fans, though personally paying a tour fee of £32.50 to stand on Dartford Station and then to look at Len Goodman’s dance studios (which incidentally are situated above a kebab shop in Market Street, Dartford) has a somewhat limited appeal. I hope the tour does well. You can read more about it, and see some vintage photos of the legendary rockers if you click here. Last week I featured Walnut Tree House, which until 1932 used to occupy the site now the home to Erith Council Offices. Walnut Tree House was owned by John Parish, a successful businessman who owned Erith Ballast Wharf on the banks of the River Thames, and also the ballast and loam pit in what is now the Europa Industrial Estate in Fraser Road. Once the pit was exhausted, it was decided that the great big quarry was ideal for use as a sports venue. Erith Cricket Club, Erith Football Club and Erith Shooting Club all used the facilities. A later ballast and loam excavation site was located on the land sided by Bexley Road and Fraser Road, which was eventually worked out in 1970. Since then it has been unused, though as Malcolm Knight of Bexley Is Bonkers has pointed out, there are rumbles that the site may finally get redeveloped – it got purchased by an Essex based property development company called the Anderson Group back in January, most likely as a housing estate. The situation is still far from decided. I will be keeping tabs on it. Other planning news indicates that the traveller pony that has been living on a piece of waste land at the end of James Watt Way may be in danger of losing its home. Bexley Council are discussing the potential redevelopment of the old RMC Aggregates site (currently in temporary use by Abbey Car Breakers as an overflow from their main site) and the adjacent river front land, including the area currently occupied by the pony. They are keen for the site to be used for industrial or commercial purposes; I quote:- “The eastern part of the site offers opportunity to make use of the river frontage. Accordingly there is a preference for industrial and commercial uses. As these are in close proximity to existing and potential residential areas it is necessary to ensure that new industrial and commercial development is of high environmental standard, especially where close to residential properties”. It will be interesting to see where they go with this. More news as it arrives. 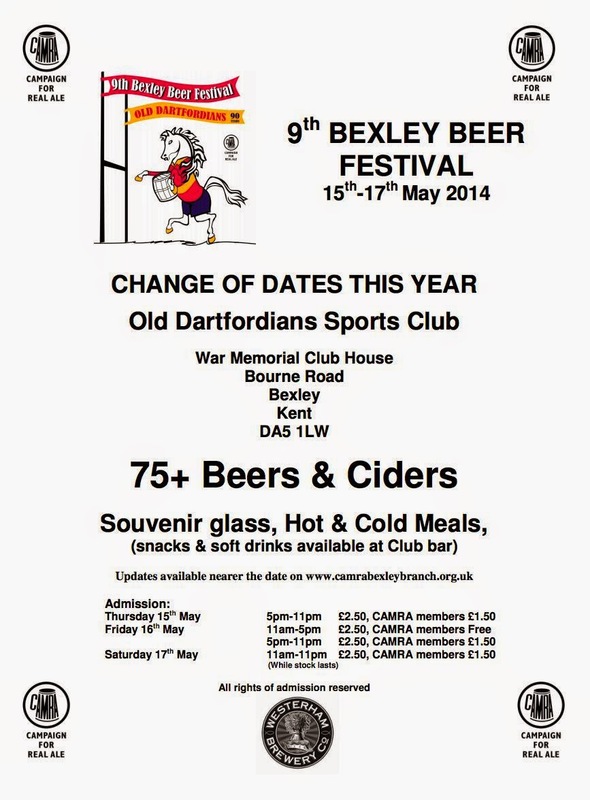 The ninth Bexley CAMRA Beer Festival is almost upon us; it runs from the 15th to the 17th of May, and is held at the Old Dartfordians Sports Club in Bexley Village. It is an excellent venue, and is much better served by public transport than the old venue, which used to be Sidcup Rugby Club (a great venue, but miles from anywhere and a pain to get to and from). Not only is the Old Dartfordians Club far easier to travel to and from, but it is in fairly close proximity to Bexley Village itself – which is helpful if one fancies a post festival curry, as there are several Indian restaurants in the town that display a three star or higher “Scores on the Doors” rating. I will be covering the festival in greater detail after the event. I received the following message in the week from a local musician and Vox enthusiast, following my piece on the connection between Vox and Erith. "I am contacting you about your recent MS story about the Stones and/or The Beatles visiting the Vox factory in Erith. I would refer you to Jim Elyea's excellent book "Vox Amplifiers - The JMI Years" Vox's main facility was at 119 Dartford Rd. According to Jim's book, JMI production moved to the Erith building in 1965 and production continued there despite a fire on December 1 1965, it is not clear whether Vox actually owned the building as it also housed another Royston Industries company Burndept's Ltd (JMI was partly owned by Royston at this point). In January 1967 there were 150 employees at Erith. The Vox factory in Erith was closed in 1970. Apparently Mick and Keith were regular visitors to the Dartford factory as they were Dartford boys themselves but all reliable sources confirm that the Beatles never visited the Vox factory in Dartford or Erith. The Kinks, also Vox users, never visited the factory as "it was too dangerous for Muswell Hill boys to go to Dartford". Tony Hicks, lead guitarist with The Hollies was a frequent visitor, as were the Dave Clark Five. Hank Marvin brought his red Fender Stratocaster that he had bought at Jennings shop at 100 Charing Cross Road into the Dartford factory one day because he was having trouble keeping it in tune...the powers that be simply decided to give him a new one. The Charing Cross Road shop was more likely to have been frequented by the stars of the time. Much more information including photos, lists and details of JMI employees can be found in Jim's excellent book ". Local bus company Stagecoach buses are currently testing new, hybrid engine double decker buses. On Tuesday afternoon I saw one running on the 602 school bus route. The very smart looking, brand new bus was in the middle of Bexley Road at the bus halt in front of the Erith Riverside Shopping Centre. It had broken down! The driver and another Stagecoach person (possibly a mechanic) were trying to restart the vehicle, which appeared to be completely dead, apart from working hazard warning lights. These vehicles are largely reliant on computer control, and I would not have been surprised if there was a computer related problem – this is one of the most common causes of faults on the networker trains used by South Eastern. I have witnessed this whilst on the platform at both Cannon Street and Dartford stations. The driver could not get the train to start up - it had completely frozen. He ended up doing what many PC users do in such circumstances – he switched it off, then back on again. I suspect that the bus crew would probably end up having to try the same technique. I hope that the teething troubles are soon overcome, as it would be a great move for Stagecoach to replace the older vehicles in their fleet with more economical and lower emission buses. Ideally they would go for Hydrogen fuel cell powered buses, as have run in and around Waterloo in the past. The trouble with these zero emission vehicles (OK, they emit a little water vapour, but that is it) is that currently they are prohibitively expensive to purchase. Hopefully as the technology matures, the costs involved will come down and we will have many hydrogen fuel cell powered vehicles. Word reaches me from one of my confidential sources that the closure last Wednesday of The British Music Experience exhibition at the O2 Arena was long overdue. My source, who had some involvement with the project in the past wrote “It was a fabulous exhibition with interesting exhibits and lots of audio visual interaction, but unless you went around it slowly and logically there was almost too much to take in. The ticket booth was set up on the assumption that there would be huge queues lining up, but I found both the 02 and the British Music Experience like a ghost town, and sometimes I saw more staff than visitors. The entry fee was very high indeed - it was always my view that the place could not survive”. This is all a great pity. From my understanding the reason for the closure is that their sponsors refused to renew their support for the 2014 / 2015 season; the Experience is now looking for a new home. I wonder if a local venue might make a good place for The British Music Experience might be the former Woolwich Granada Cinema? It is currently being used as a cathedral by the Christ Faith Tabernacle Church, who seem to have made a very good job of restoring the old Art Deco building, which has Grade II listed status, so I very much doubt if they would be interested, which would be a pity, as the Granada has strong historical musical connections; it was used in the 1950’s and 60’s as a live music venue as well as a cinema. Buddy Holly held some gigs in 1958 (one of which my late Dad attended), Roy Orbison, and even the Beatles played the place back in 1963 – though I doubt they would have been heard over the screaming! The video to end this week is a curiosity. It, along with several others, has been made by a professional Hollywood film editor. He's taken an episode of Gerry Anderson's "Space:1999" and intercut it with an episode of the original "Battlestar Galactica" to tell a completely new story. It really does go to show just how much a good editor can do to influence a film. It is very well done; for the most parts you cannot "see the joins". Feel free to leave a message below, or Email me directly at hugh.neal@gmail.com.